Rockville is proud to introduce the all new PBG18 18” professional subwoofer. 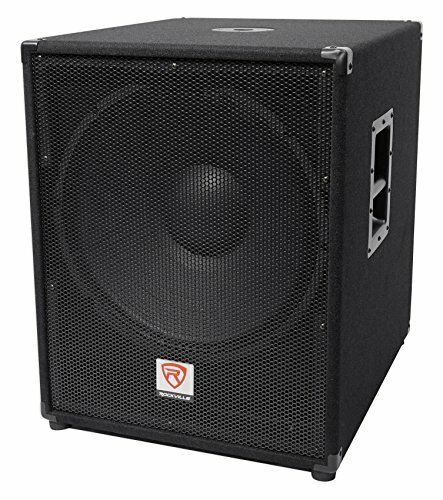 This latest addition to our bass gig series is our most powerful and best quality passive subwoofer to date. We tested these against subwoofers from leading brands in the industry such as Peavey, Yamaha, and others and these held their own! Please do not compare this to any off brand name subs. This subwoofer is commercial grade. The advantages of purchasing Rockville, Yamaha, Peavey, or other high end brands are longevity, power, sound quality, and sensitivity. We did so much testing. There is a huge difference between the quality and components of this versus off brand names. The off brand enclosures are built with a material called particle board. We spend more money manufacturing these with MDF, which will hold up for a much longer time than particle board. Better quality wood also equals better sound! The pro audio subwoofer in the cabinet has a very large 4" KSV voice coil and a 100 oz. high quality magnet. The off brand names models will usually have a magnet half the size and a voice coil half the size as well. The advantage is that our unit can handle more power and will last longer. These subs can take a real beating! Another thing we wanted to focus on is the sensitivity. When we were doing all our testing we noticed with the same amplifier, one subwoofer we were testing against went louder than the rest. The reason was because it had a better sensitivity rating. This means that it was more sensitive to amplifier power. We had our engineers design this sub to have as good of a sensitivity rating as that particular sub we tested that we liked. Rockville PBG18 18" 2000 Watt Passive Pro Subwoofer w/ MDF Cabinet and Pole Mount. 18" Pro audio woofer. 1,000 Watts RMS Power. 1,500 Watts Program Power Handling. 2,000 Watts Peak Power. 4" KSV voice coil. 100 oz. woofer magnet. Vented Enclosure for Improved Bass Response. Pole Mount.Rubber Isolating Feet. 1/4" Jack (In/Out). SpeakON (In/Out). All input/output connections are internally connected in parallel. Nominal Impedance: 8 Ohm. Sensitivity: 98dB (+ or - 2 dB) @ 1w/1m. Frequency Response: 35 Hz - 4 Khz. Dimensions (W x D x H): 20" x 23.62" x 25.59" (Inches). Weight: 64 LBS. Shipping Dimensions (In Carton): (W x D x H): 20.47" x 24.41" x 26.38" (Inches). Shipping Weight (In Carton): 68 LBS.